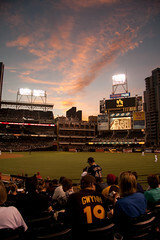 The San Diego Padres recently completed their 42nd year of existence without a single World Championship to their name. An expansion team in 1969, they have never enjoyed a 100 win season, but have lost at least 100 games five times. Over the years, however, they have produced some very good ball players, and even a few strong ball clubs. This year’s version came within one victory of winning their division for the sixth time, finishing with a 90-win season for the first time since 1998. They have gone on to the World Series twice, getting swept by the Yankees in 1998, and losing to the Tigers in five games in 1984. Trivia Question: Who is the only Padres pitcher to ever win a World Series game? Answer below, after this post. As a boy growing up on the east coast in the 1970’s, the Padres were a mysterious team of unfamiliar names sporting garish, ugly uniforms. But since the Padres were almost always a bad team in those days, at least I knew that my Mets would stand a good chance of defeating them in a season series. By the time the Padres enjoyed their first winning season in 1978, I was already well into high school, and my interest in baseball waned as the Mets languished in the basement of the N.L. East. Even as a youthful baseball card collector, I can’t say that many Padres players stood out as the kind of name players you could offer up in a trade for, say, Johnny Bench or Reggie Jackson. But my fog of ignorance regarding Padres players from that era has lifted to a certain degree recently while researching players and stats for this post. I was surprised, for example, that the Padres pitcher with the highest single season WAR was not Kevin Brown, Jake Peavy or Randy Jones. It was, in fact, Dave Roberts. No, not the speedy outfielder Dave Roberts of recent years, swiping bases for the Red Sox, Dodgers, Padres, etc. Dave Roberts was a left-handed pitcher for the Padres from 1969-71, before moving on, in quick succession, to the Astros, Tigers, Cubs, and a couple of other teams, eventually retiring after the 1981 season with a career record of 103-125. 1971 was Dave Roberts Best Forgotten Season with the Padres. Dave Roberts finished the season with what, at first glance, looks like an unimpressive 14-17 win-loss record. But the Padres record that year (just their third campaign since expansion) was 61-100. Robert’s posted an impressive ERA of 2.10 in ’71, second best in the N.L. He made 34 starts, completed 14 games, and hurled 269 innings. His 1.109 WHIP was seventh best in the league. Not a strikeout pitcher, he fanned just 135 batters in ’71, but he also knew how to keep the ball in the park, surrendering just nine home runs. Robert’s ERA+ was 157, almost as good as the 158 that Jake Peavy recorded in 2007 when he won the Cy Young award for the Padres. But like Randy Jones, Dave Roberts was a good pitcher on bad Padres teams. Jones, however, managed to get enough run support to enjoy consecutive 20-win seasons in ’75-’76, while Roberts never topped his 14 wins in ’71. Dave Roberts efforts did not go completely unnoticed by Cy Young voters, however. Even with a losing record, Roberts finished a respectable 6th in the Cy Young vote in ’71. Roberts passed away on January 9th, 2009, having enjoyed one fine, yet largely forgotten season as a major league pitcher. Roberts did have one teammate who could slug the ball, however. His name was Nate Colbert. From 1969-73, Colbert slugged 149 homers in five seasons, averaging just under 30 homers a season on a team that badly needed all the offense it could get. Unfortunately for Dave Roberts, Nate Colbert’s best season occurred the year after Roberts got traded to Houston. 1972 was Nate Colbert’s Best Forgotten Baseball Season. Colbert was not a well-rounded ballplayer, but he knew his strength, which was, in fact, strength. He wouldn’t hit for much of an average, and he never won a Gold Glove for fielding his position, but he could certainly hit the long-ball. In 1972, Nate Colbert finished third in the N.L. in home runs with 38, behind a couple of guys named Aaron and Bench. He had also hit 38 homers a couple of years earlier in 1970, but this time around, he also added 111 RBI’s as well, good for 4th best in the N.L. He added 27 doubles, 87 runs scored, 70 walks, and a .508 slugging percentage, sixth best in the league. His 286 total bases was the fifth most in the N.L., and his 67 extra base hits were the third highest total in the league. He posted an OPS+ of 145, and his WAR was 5.2. Each of those numbers placed him in the top ten in the league. Colbert wasn’t a huge speed threat, but his 15 stolen bases coupled with his home run power produced a Power-Speed # of 21.5, 4th in the league. Colbert was named to the All-Star team, and he finished 8th in the N.L. MVP voting in ’72. His .250 batting average, at a time when that statistic was more highly regarded than it is today, was a primary culprit in suppressing where he otherwise might have finished in the voting. Unfortunately for Colbert, and for the Padres, he enjoyed just one more productive season the following year before going into a steep, irreversible slide at age 28. He was out of baseball by age 30. Nate Colbert’s .469 career slugging percentage is still sixth-best all-time on the Padres. He remains on the Padres top ten all-time lists in at bats, hits, runs scored, RBI’s and walks. He is the all-time Padres leader in Home Runs (163) and strikeouts (773). Early next season, however, Adrian Gonzalez will break Colbert’s career home run record; Gonzalez currently has 161 career home runs for San Diego. But in the first half-dozen years of the Padres existence, Nate Colbert was their primary offensive weapon. Now, if only the Padres could find a slugger to pair up with Adrian Gonzalez, they might create some new team history their fans could be proud of. Answer to Trivia Question: Andy Hawkins defeated Dan Petry in Game 2 of the 1984 World Series. I thought he was destined for the Hall of Fame. For a five-year period, from 1987-91, Will “The Thrill” Clark of the San Francisco Giants was one of Major League Baseball’s most dominant players. His eye-black and competitive nature provoked fear in many opposing pitchers. His glove around the first base bag was plenty good, but it was his bat they feared and respected most of all. During that five-year period, Clark averaged 27 home runs, 104 RBI’s, 94 runs scored, a .304 batting average, an OPS of .900, and an outstanding OPS+ of 153. He accomplished all of this while playing in one of the better PITCHER’S Parks in the N.L. By way of comparison, Hall of Fame first baseman Tony Perez topped an OPS+ of 150 only twice in his 23-year career. Giant’s Hall of Fame first baseman Orlando Cepeda topped 150 three times. Yet another Giant’s Hall of Fame first baseman, Bill Terry, touched an OPS+ of 150 in just two seasons. Will Clark topped an OPS+ in five separate seasons, as many as Cepeda and Terry combined. Obviously, then, Will Clark had several outstanding seasons before he turned thirty years old, and many other good seasons during the rest of his career. Will Clark’s Best Forgotten Season was in 1989. As with some of the other players I’ve profiled in this series, a case could be made for one or two other seasons as well. But ’89 was arguably Clark’s best season for several reasons. In 1989, the 25-year old Clark batted .333, second best in the league. He accumulated 321 Total Bases, again, good for second best in the league. His WAR was a league-leading 9.4. He led the N.L. in runs scored with 104. He posted a career high 196 hits, and his OPS (.953) and OPS+ (175) were also each second best in the league. He won his first Silver Slugger award, and he played in the All-Star Game. Clark’s 136 Runs Created led the N.L. He led the N.L. in times on base with 275. He hit 23 home runs, drove in 111 runs, knocked 38 doubles and added nine triples. Defensively, his Range Factor / Game of 9.85 was also the best in the N.L. Just for good measure, he was voted the N.L.C.S. MVP by single-handedly smashing the Cubs pitching to the tune of a .650 batting average, a .683 on-base percentage, and a ridiculous slugging percentage of 1.200. Will Clark finished second in the N.L. MVP voting in 1989 to teammate Kevin Mitchell who slugged 47 home runs and drove in 125 runs. Clark finished in the top five in MVP voting four times in his career. He played in six All-Star Games. He won one Gold Glove, but was good enough to have earned more. Astonishingly, Will Clark’s career OPS+ of 137 is better than 90 hitters currently in the Hall of Fame. It is also better than two of his more celebrated contemporaries at the first base position, Don Mattingly, (127), and Keith Hernandez, (128). The primary reason’s why Clark is not a member of the Baseball Hall of Fame have to do with his career power numbers. Hall voters like to see lots of home runs and RBI’s from a first baseman. Clark’s career totals in these two areas — 284 home runs and 1,205 RBI’s — look modest compared to some of the other first basemen in The Hall. Clark also never won an MVP award, and he never played on a World Championship team. Clark ended his fifteen-year baseball career after the 2000 season when he was just 36-years old. But he showed even in his final days as a player that his bat was still just about as dangerous as ever. As a member of the St. Louis Cardinals in the last 51 games of his final season, Clark batted .345, had a .426 on-base percentage, slugged .655, and compiled an OPS of 1.081. He smoked 28 extra-base hits in just 171 at bats. Although Clark’s best overall season had occurred almost a dozen years earlier, clearly he had saved the best for last.